A wedding is an important occasion not just for the bride and groom, but for their family and friends, and the people they have invited to share their special day with them. Resultantly, many people will travel from far and wide to be able to attend, and will make the effort to buy a suitable outfit, to purchase a gift for the couple, and to give congratulations and good wishes. With so much effort being put into attending, it is becoming more popular for the bride and groom to offer something in return to their loved ones – these do not have to be grand gestures (or expensive ones! ), but small tokens that guests can take with them to remember the wedding by. So we at Zankyou have collated what we think are 6 of the most innovative, creative and simply fun wedding favours that you could provide for your guests – check them out here! Catsi Creative is a small company that specialises in woodworking – the perfect addition to your bohemian or vintage-style wedding. Their company caters for a variety of different events, including birthdays, engagements, and Mother and Father’s Day, and they have an extensive online portfolio. 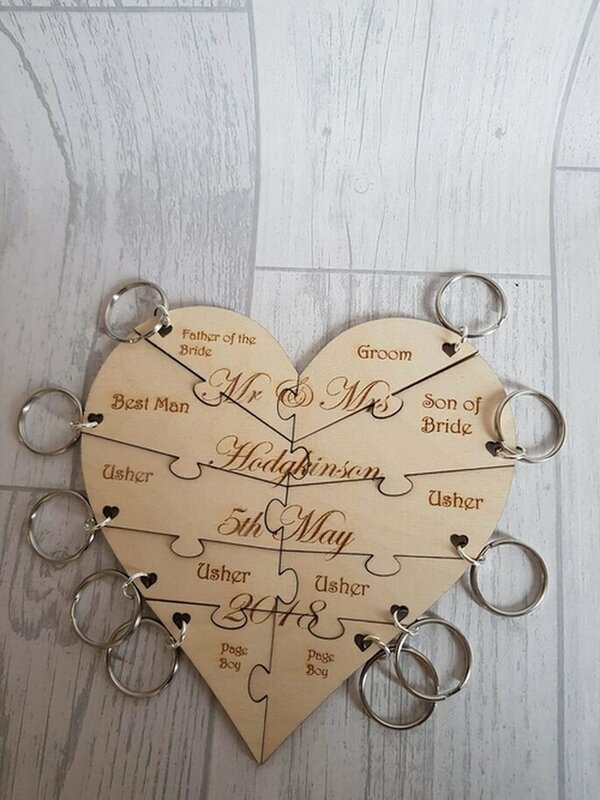 However, their wedding features and favours are our favourites – from personalised drink stirrers, to freestanding signs and keyrings, there is something here for every budget. Prices begin at a mere 80p per unit, and only exceed the £10 barrier for some of the much larger pieces. The cost here is very minimal, particularly given the effort that goes into creating these pieces, which includes the delicate process of burning letters and numbers into the wood. One of Zankyou’s favourite things about Catsi Creative is the astounding variety of products that are available for brides and grooms. Some of them we have already mentioned, but there are many others including table placement names, baubles for Christmas trees, and bookmarks. They also offer larger decorative pieces which are very innovative, such as framed wooden plaques, and wedding guest books with a travel theme. Check out their website now for ideas on economical wedding favours that will wow your guests! 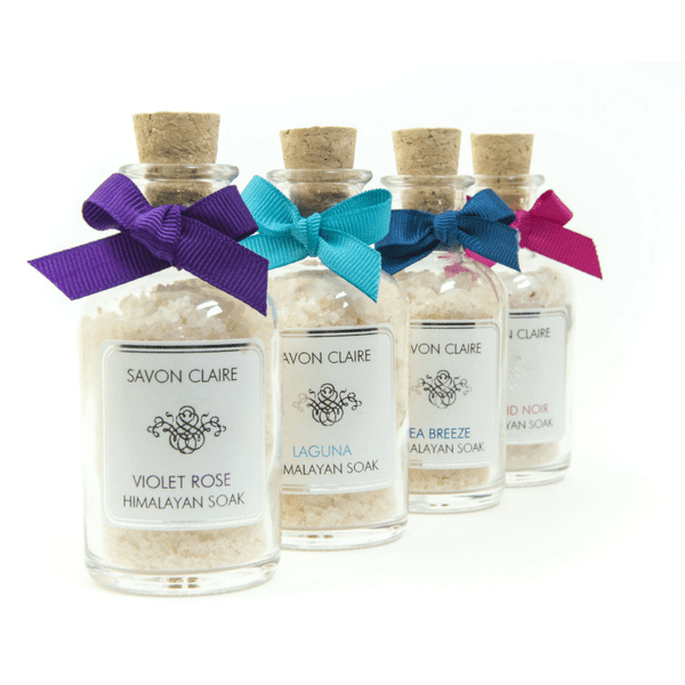 Savon Claire is a company that specialises in homemade bath and body products, who have created a special range of wedding favours based around this theme. 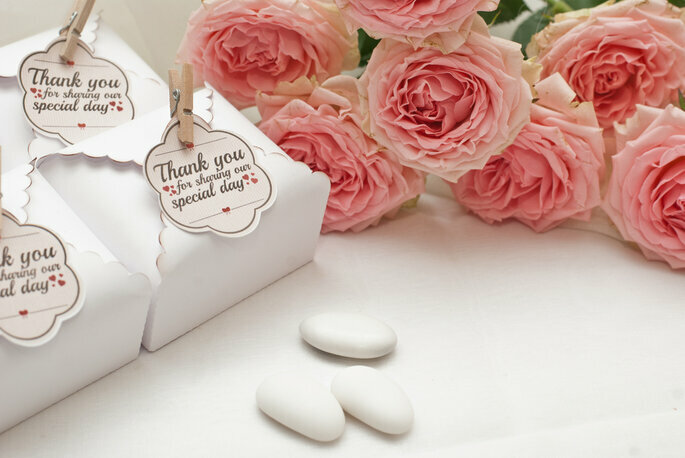 Their inclusion of the personalisation of gifts is very impressive, and though the range is still growing, there is a variety of options for what to order, from soaps to bath crystals to travel candles and commemorative ceramic plaques. These also come in at a very reasonable price – generally staying between the £3-7 per unit range, and extending to £16 for the most luxurious items – and can be bulk ordered to provide something of note for all of your guests. One of our favourite things about Savon Claire is its dedication to using ethically-sourced ingredients and materials. For example, their individual bath truffles are made using Shea butter provided by a Ghanian project that supports womens’ rights and sustainability, and natural materials are prioritised over chemicals and synthetics. Savon Claire also ensure that all of their packaging is 100% recyclable, and work to ensure waste is absolutely minimal. If you choose to buy from their range, you’ll not only be getting a unique product that looks and smells amazing (! 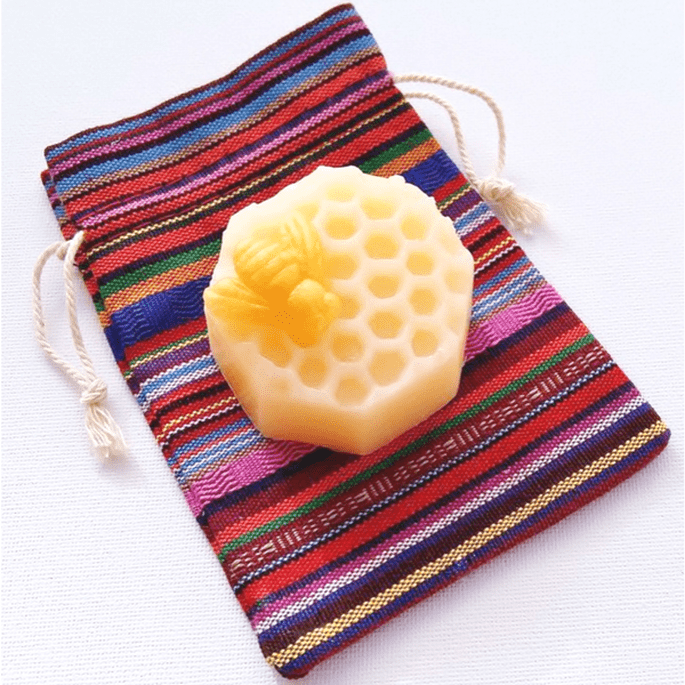 ), but an environmentally and ecologically friendly gift for your guests. Delicate and endearing, the glass tokens from Red Brick Glass are made by the professional glassmaker Wendy Jeavons, and are a beautiful way of commemorating your wedding with your guests. Designs can be commissioned directly with Wendy, meaning that your guests will be receiving a one-of-a-kind product that will never be replicated. Every piece is made with care and great attention, and finished by hand to ensure maximum quality – and there is a huge range of options, from glass flowers embossed with the bride and grooms’ initials to personalised glass coasters. Wendy can even include an image of the venue! 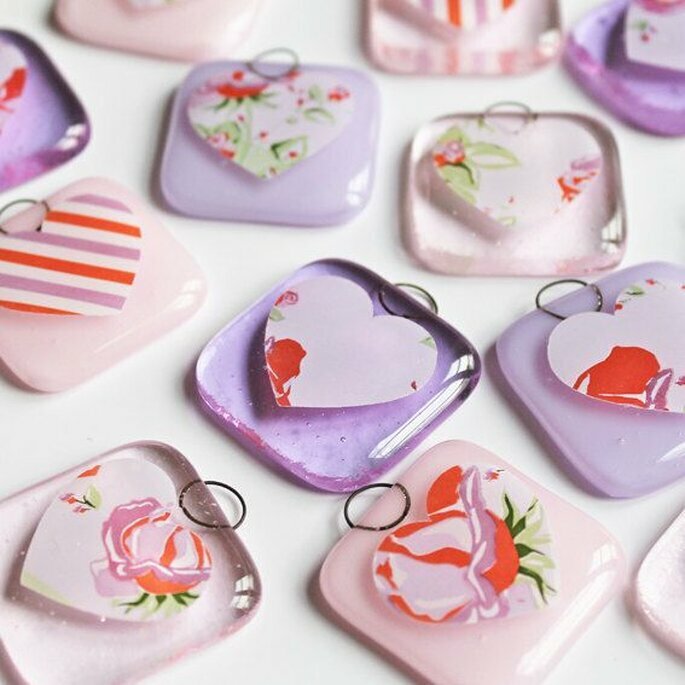 Alongside being a very sweet idea, these glass works of art are also very suitable as wedding favours as they are durable, and can be kept for many years. 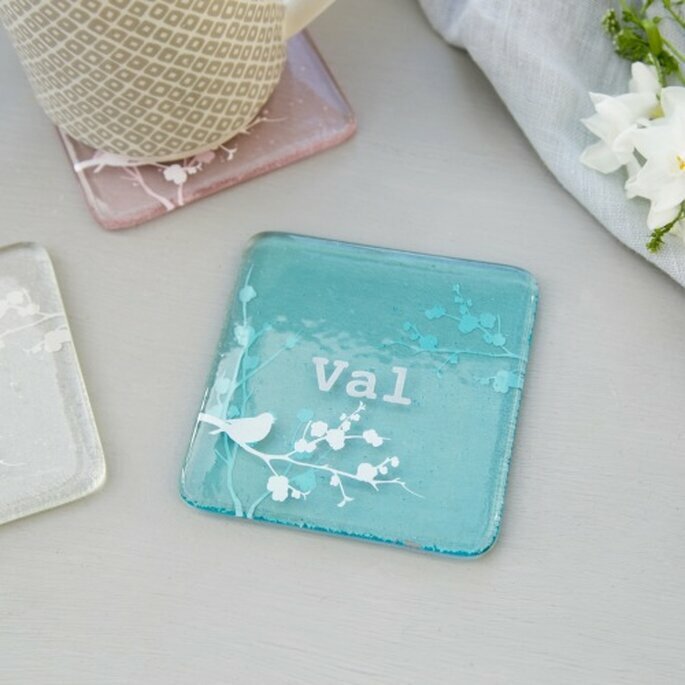 With personalisation offered at an additional cost, the glass favours from Red Brick Glass are very equitable, beginning at around £6 for glass gift tags, and normally coming in around the £10-£15 mark for larger objects such as coasters and glass flowers. Given that everything is made by hand, we at Zankyou think these delightful products are more than worth it. For a wedding favour that your guests will be able to keep forever, take a closer look at the services that Red Brick Glass offer! The largest, and most well-known provider in this article, Krispy Kreme have recently begun a new service for doughnut-related wedding favours – and who could say no! Comprised of an individually sealed box (with a doughnut inside) which can be personalised with the names of the bride and groom as pictured below, this particular wedding favour is a delicious treat for your guests to enjoy the next morning, to help keep the magic of the big day alive for just a little longer. 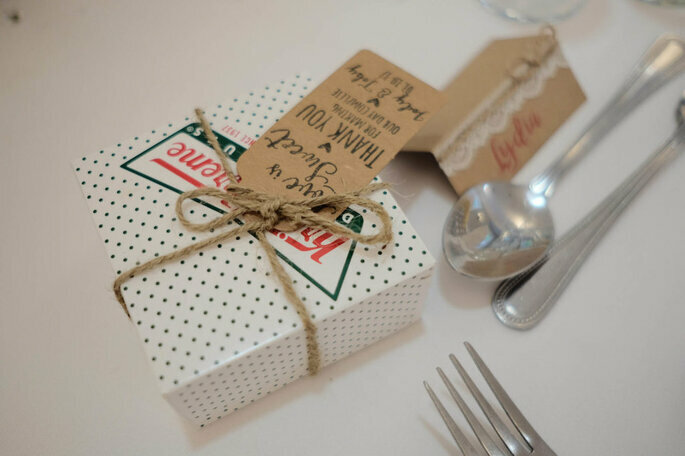 With prices ranging between £1.80-£2.15 per unit (though bear in mind there is a minimum order of 60 units), with an additional £1.50 for personalisation services, Krispy Kreme’s wedding favours are quite reasonably priced, and can be delivered directly to your venue. Krispy Kreme also offer doughnut towers for weddings, which is a trend that many couples have chosen to follow in recent years. Instead of the intricacy involved in planning and designing a cake, and then trying to cut it into 200 equal pieces, Krispy Kreme offers an eight-layer tower of 216 doughnuts which can be purchased for £355. As with the wedding favours, a variety of flavours are on offer – including original glazed, chocolate custard, and strawberries and cream. 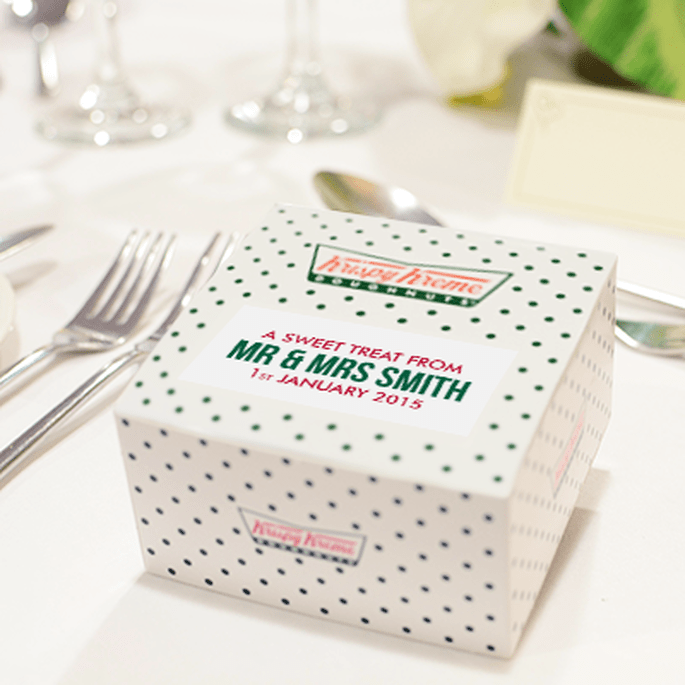 For a wedding favour that you can be sure your guests will love, have a look with Krispy Kreme! 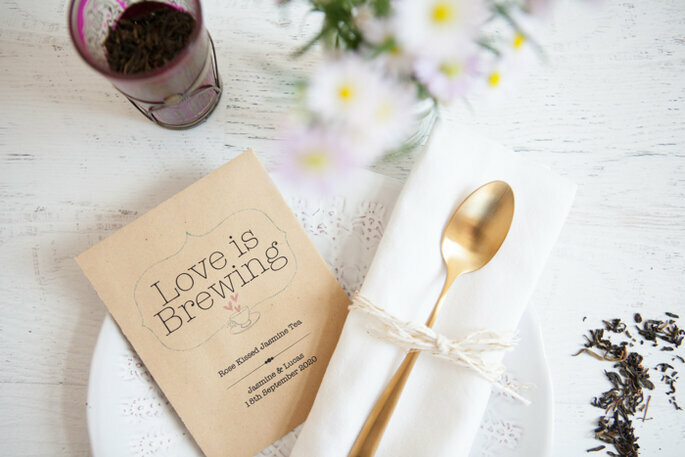 One of the most novel wedding favour companies, Wedding In A Teacup create unqiue little gifts with a boho-vintage theme. The vast majority of their products can be purchased for less than £10 per unit – but quality is never lost. For example, their very cute personalised one-person portions of loose-leaf tea as pictured begin at a mere 50p per packet and are a lovely little way to thank your guests for their attendance. And, whilst being very affordable, Wedding In A Teacup also use eco-friendly ingredients and packaging for their products – another bonus of choosing them! Wedding In A Tea Cup have a huge array of products for wedding favours – from tea to stationery to chutney, confetti and seed packets. 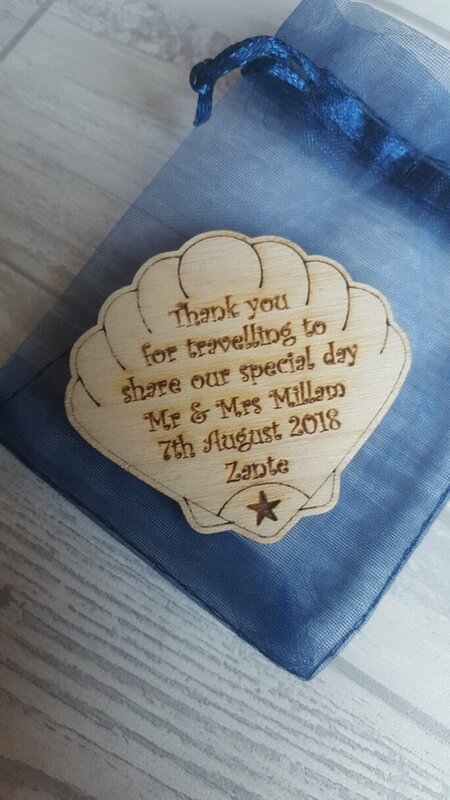 Most products come with personalisation options, and the low prices make this company ideal for couples who are expecting a large number of guests, but still want to do something special. For small products with lots of character, check these guys out. 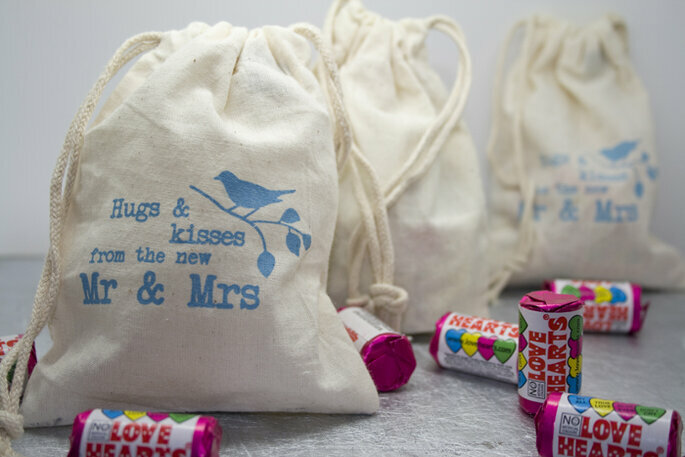 And of course, check out our directory for even more wedding favour providers! Check out these cute and original gift ideas for your guests. Something for all different tastes, budgets and styles. "Love is all about the little details" Every day love art tell us how to 'show' your love in a picture. Seeing these beautiful images shows that love always triumphs. We love being in love, do you? Dreamlines Sketches, they are as dreamy as they sound! Here is how to become Husband of the year. A hand drawn, personally bespoke wedding memory that your bride and wife, can and will cherish forever. A truly unique gift. Original wedding gift ideas for couples that have everything!